The Maintenance Division consists of two sections, Adams and Cloverdale, employing more than 130 team members. This team is responsible for maintaining more than 5,085 lane miles of roadway and more than 766 bridges and large culverts within the ACHD's jurisdiction. The Adams Section is located on Adams Street in Garden City and the Cloverdale Section is located on North Cloverdale Road. The Maintenance Division's responsibilities consist of pothole patching, drainage facility maintenance, pavement maintenance and repair, street sweeping, grading of alleys and gravel roads, roadside and storm drainage pond weed abatement, bridge maintenance, and winter snow and ice control. ACHD's Adopt-a-Highway Program is a litter control program that allows private citizens to support the Ada County Highway District's anti-litter campaign by “adopting” sections of roadway and agreeing to keep them clean. It offers families or organizations an inexpensive project that gives members the satisfaction of making a contribution to the community. It also generates publicity for the group’s service activities. In 2017-2018, 97 groups participated in ACHD's Adopt-a-Highway program. There were 57 clean-up events and 10,200 pounds of debris collected. There are 108 miles of roadway in the program. Each year, both Sections combine efforts to apply chip seal surfacing to over 450 miles of roadway in Ada County. 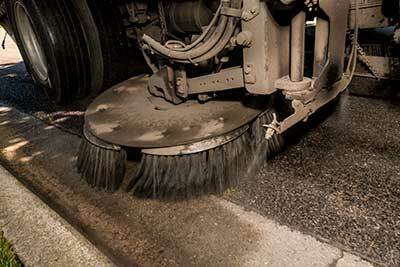 Chip sealing is done to protect the surface of a street from wear, water, and weather damage. The chip seal application is done to both old and new streets to maintain existing pavement, delay the aging process, and provide an armor coat for skid and weather resistance. Another aspect of chip sealing is simple economics. Chip sealing saves taxpayer dollars because it protects the road from deterioration and greatly delays the need for a new asphalt overlay (new black top). In 2015, the cost for chip sealing was $30,000 per mile, compared to an asphalt overlay where costs average $335,000 per mile. Maintaining quality roads is a top priority of ACHD and crack sealing helps to protect the public investment. 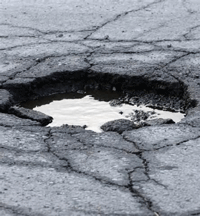 Cracks in asphalt that are one-quarter inch or larger in size are sealed to help keep the water out of the layers of roadway. This can extend the life of the road and reduce the chances of potholes, deterioration and pavement failures. In addition, crack sealing better prepares a roadway for future maintenance such as a chip seal. To protect public safety and prevent property damage, ACHD designs and operates its drainage systems to prevent standing water on traveled areas. Countywide, ACHD owns and operates a storm drain system comprised of approximately 697 miles of storm drain pipe, 7,057 sand and grease traps, 24,023 catch basins and more than 90 detention and retention ponds. Drainage maintenance is also responsible for cleaning more than 185 miles of irrigation pipe, 8,282 irrigation structures, and over 12,500 manholes. The ACHD partners with the Ada County Sheriff's Office (ACSO) as part of a program to beautify Ada County. The Labor Detail (LD) is a work crew made up of low-risk, nonviolent offenders. LD individuals do not spend the night in jail, after the workday they return to their homes. ACHD has a county-wide plan to touch each area of the county for cleaning and weed removal. The county is divided into four zones with the intent of working through the entire county a minimum of once and sometimes twice per year. Maintaining a pedestrian network that is safe and accessible to all users is a high priority of the Ada County Highway District. Starting in 2003, ACHD began to inventory and evaluate pedestrian infrastructure of more than 19,000 street corners and over 1,400 miles of pedestrian facilities. ACHD is one of only a few countywide entities in the United States to have completed this effort, which ultimately addresses mobility options for all Ada County residents. The ACHD Safe Sidewalk Program is one of the many of the District's efforts to provide safe pedestrian infrastructure. The ACHD sweeping crew operates street sweepers all year removing leaves, dust and sand from the roads. There are many benefits to the sweeping program. Removing dirt and debris contributes to roadway safety, dust abatement, and helps keep unwanted sediment and contaminants out of the storm drain system, and ultimately out of the Boise River. Some of the street sweepers are also equiped with vacuum capabilities and when needed are utilized to assist Drainage Maintenance. Sweeping is also part of the annual chip sealing process. Ada County averages around 21 inches of snowfall annually. Most often, this snowfall accumulates in several small storms. The roadways also become icy from rain, freezing rain and the freeze/thaw of snowfall and frost, which creates potentially slippery conditions from November through March. Preventing problems rather than responding after-the-fact to storms best describes ACHD's approach to winter weather. Fighting ice on the pavement is the primary focus and explains the heavy reliance on anti-icing treatments with magnesium chloride. Sand, rock salt and plowing are also facets of ACHD's response, employed as required by conditions. A no cost Snow Removal Permit for HOAs, citizens and contractors was implemented during the record snowfall of 2016-2017. The program proved so successful, it will be implemented again this winter maintenance season.